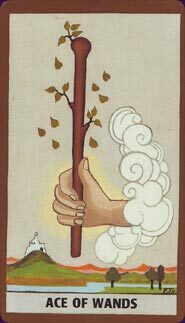 The Ace of Wands usually indicates that the querent has just discovered or wants to discover a new religion, philosophy, cause or career choice, possibly even a new sexual partner. They feel their energy go up, they feel the heat, and they want more of it. They take up the wand and start walking. Learn the Ace of Wands tarot card meaning and the rest of the card meanings, symbols and stories in our eBook.